This listing is for 10 Shabby Chic Rose Soap Favors perfect for a bridal luncheon, baby shower,bachellorette party, birthday and bridal showers. 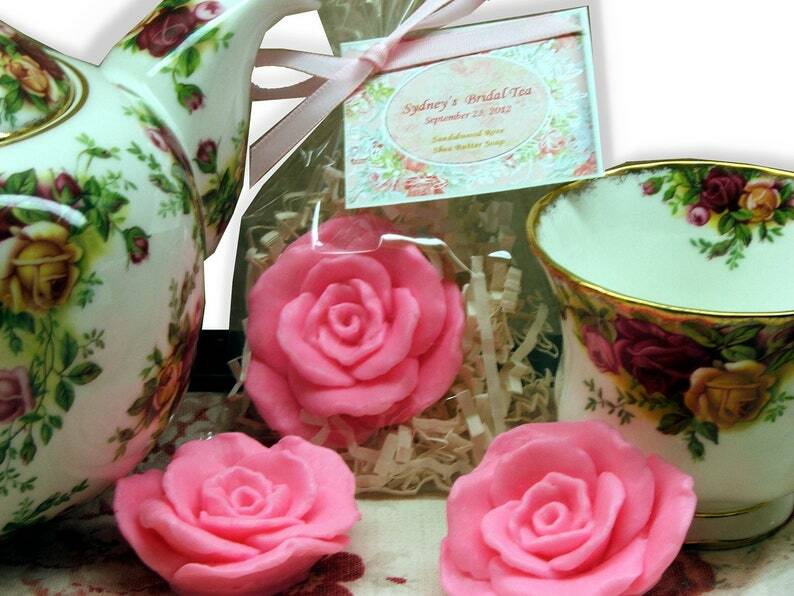 Shabby Chic Rose Soap Favors scented in your choice of color and scent. Each favor includes one soap. Soap measures apx. 2 1/2" in diameter and weighs apx 1 oz. We can make these soaps in any colors. Choose one color and scent per order of 10. 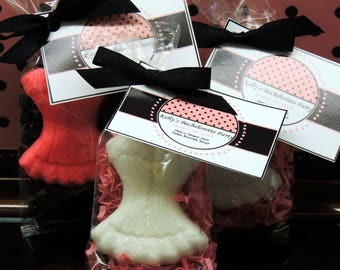 If you would like to coordinate the favors to your party colors - indicate party colors at check-out and we can customize the tags for pinks, blues, greens, yellows, etc. Ingredients: Coconut oil, palm oil, safflower oil, glycerin, shea butter, purified water, sodium hydroxide, sorbitol, sorbitan oleate, soy bean protein, titanium dioxide, micas, fragrance oil, may contain cosmetic safe glitter. Not only do these look beautiful, but each soap is made from our luscious lather shea butter moisturizing soap base and will leave your skin soft and moisturized. I placed my order early Sunday morning and left town. I got home on Thursday afternoon and my custom order was on my porch. Amazing delivery time and I couldn’t be happier with the soaps and packaging. Can’t wait for the Baby shower next weekend. Thank you! !